Our summer rate is $140.00 a night. Contact us for assistance in planning your special group getaway or make an online reservation. Your view in Autumn will be breathtaking! Each morning you wake to a beautiful new variety of colors. 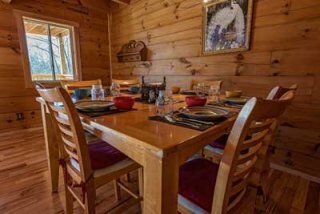 Your authentic log home has 2 bedrooms 2 bathrooms, and can accommodate 10 guests comfortably. The most treasured beauty is on the second floor Both Queens beds have a mountain view to wake up too, and a private balcony to relax on. The unique feature is the separate master bedroom, located on the first floor. 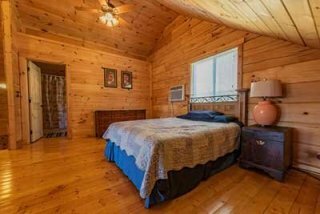 This bedroom leads to wrap around porches with rocking chairs to relax on or have a cook out. The Great room is a great place to meet it has plenty of seating for dinner or have Chef Ray Cook you a special meal. Your Great room features, 32 inch satellite TV and Wifi, and room for more guests on pull out couch. 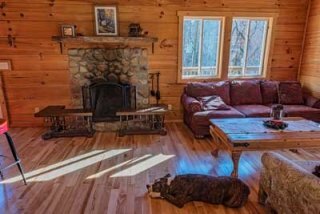 Guest who choose Log Cabin in Smoky Mountain enjoy bringing their pets and enjoy taking their children hiking right out the front door on the many trails running along creeks and waterfalls on the mountain. Master Suite King bed has our bathroom with washer and dryer. Queen bed is upstairs. This queen bed has the best view of the mountains. Living area is located upstairs brown sofa will pull out queen bed. Hi! We will be delighted to host you and your guests. Please read our listing description, maximum people that can stay, amenities we offer and our cancellation policy before you book. In the unlikely event that you must cancel with less than thirty (30) days notice, shorten your stay, check out early, or No Show, you will be charged full rate. Please understand that you must take responsibility for your entire reservation. If we can re-book your cabin, a full or partial refund will be made. If you are within 30 days of your arrival date, then the full amount is due to book. Over 30 days a credit card on file is necessary to hold the reservation. Your credit card will be charged thirty days before check in. A split payment can be arranged. If you would like to pay by check, money order, or PayPal, please call Nancy at 865-908-8181 after making your reservation to arrange payment. The total fees include a Nightly Rate. Rates are subject to change and vary during holidays and high impact periods from June through October. State Tax is 9.75% and Bed Tax is 3%. No booking fee is charged by Owner. Note: your rate covers six guests. Any additional guest over the allowed six will be charged $15 per day per person. Total Occupancy is 10. Ten is the maximum allowed including visitors. Only pre-listed guests are allowed to stay in the Cabin. $15.00 will be charged for each extra person over 6 people. Pets are allowable as they are family. There is a $75 non-refundable pet fee. Pets need some help adjusting to a new place. Think about what you are going to do with your dog while you are out. Please clean up after your pets. Satellite TV and WiFi are available. WiFi is so guests can link cell phones to check emails, search the internet, get directions and tourist information. IN NO WAY is WiFi to be used to download movies, Netflix or gaming. An additional $29.99 will be added to a guest's bill for excessive use. Most cell phone plans have Apps to help boost signal while in the mountains. Please download these Apps before you leave home. There is a DVD player to watch CD's. You can bring your own or rent from Redbox at Walgreens locations. 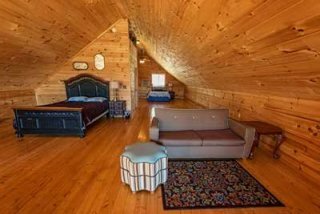 "We Loved the Cabin".We were booked for two days and ended up staying more. We were in nature at its best. This was a special occasion a family reunion, oh! My daughter had grown up so beautiful and I'm proud of her and her better half raising a fine Grandson. The rest of my family planned a historical cookout, I spent all day peeling potatoes for my famous potato salad, the meat that had marinated all night turned out perfect, but the apple pie was the best. We were so stuffed we took a hike on the creek trail. 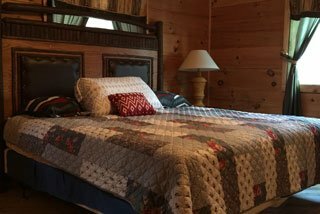 The cabin was perfect size to accommodate my family, clean and comfortable and the staff was very helpful. We'll be back next year and I would recommend the cabin to my friends." 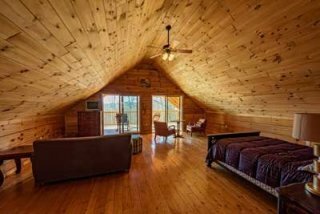 Log Cabin Rental in Smoky Mountains accepts credit/debit cards for Visa, MasterCard, American Express, or Discover, money orders, and Pay Pal.